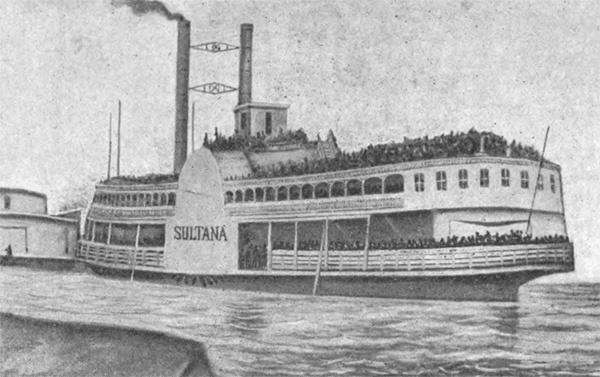 The Sultana exploded on the Mississippi River on 27 April 1865, north of Memphis, Tennessee. The majority of the passengers were military personnel. Rated to carry 376 passengers, and taking on over 2000 passengers, 250 hogheads of sugar and 60 mules and horses, after having a boiler repairs a day before is a disaster waiting to happen. To top this off the soldiers were from prison camps and were sickly and emancipated from their stay there. The ones that did not burn or die in the fire were more likely to die from drowning due to exhaustion and cold if they escaped the boat. This side wheeled ferry was commissioned to take Union soldiers home after the war, just days after President Lincoln was murdered. They were to take on the men who had been held in prison camps to Cairo, Illinois as a trade of prisoners of war. Why would the captain of the boat do this? Probably for money. But a more disturbing question is why the military officers who were in charge of arranging transport for these men would allow a boat to be overloaded with this country's heroes. Read the book introduction here and get a copy of this book from your local library to read more. We have extracted the lists of men who were passengers on the Sultana from the book LOSS OF THE SULTANA AND REMINISCENCES OF SURVIVORS. BY REV. CHESTER D. BERRY, and then went through the lists and researched each man to correct spellings, add who was killed, survived, or lost. The book contains three lists of men. The first is the official list of men on the Sultana that was released by the government before the publishing date, it is riddled with errors. The second is an unofficial list compiled by the author of men that were not on the 'official' list but known to be on the boat. The last list is one of the men living at the time the book was written with their known addresses when available. Please note that there may be other men that are not listed here. If you know of any Michigan men not listed here we will gladly check listings to find them and add them to the list. UPDATE: January 2012 - More corrections to the original book citations have been made. Added a citation from the source, Record of Service of Michigan Volunteers in the Civil War, 1861 - 1865 to each man found. This has allowed us to correct more of the records found in the book Loss of the Sultana...... Errors found in some records as to the name spelling (some so far off it makes you scratch your head! ), regiment, company and rank were found. This has also allowed me to confirm a few more men that were on the boat, and disqualify some that were listed in the Official List but had died months before the Sultana blew up. I also managed to find a few men who were not on the Official List. More research will be done on these brave men and I will add more data in at each phase.